Servaris ProServ e1400P is designed for High Volume Serving and Virtualization. 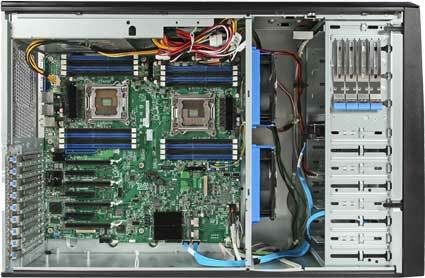 The 2 socket (Dual Intel Xeon) Pedestal Server supports Intel E5-2600 Processors for optimum processing power. Optimized for Virtualization, Intranet and Internet services and applications. ProServ e1400P supports up to 512GB DDR3/1866 MHz. E.C.C. Registered Memory which provides the basis for effective Server Virtualization. In environments where the need for a single reliable Server with dual 8-Core Intel Xeon Processors are required, the ProServ e1400P provides you with an ideal solution with excellent Return on Investment. Servaris ProServ e1400P is ideal to host Databases, eMail, Web Sites and store documents, spreadsheets and other data. Servaris ProServ e1400P Supports Microsoft Windows 2008 R2 and Windows 2012 Operating Systems. It's Open Source Operating System Ready and supports CentOS, FreeBSD, Fedora, Red Hat, SuSE, Ubuntu. Servaris e1400P provides a cost-effective solution for all types of Business's and Organizations requiring the benefits of Dual Intel E5-2600 12-Core Xeon Processors with up to 512GB memory and excellent redundancy for data and Virtual Machines. • Supports both 32-bit and 64-bit Operating Systems such as FreeBSD, Linux Red Hat, Linux SuSE, Fedora Core. Microsoft Windows 2008 R2 Server and Windows 2012 Server. • Create multiple RAID arrays with online Hot-spares. Network: 4 x Intel L350 (10/100/1000) Server Network Ethernet Controllers. Memory: 16 Dimm slots supports up to 512GB DDR3/1866Mhz E.C.C. REGISTERED Memory. • Base System IPMI 2.0 remote Bios and OS Console Redirection support, PXE boot option, IPMI compliant Server Chassis and Server Board and Server Management Software included. Power: 2 Hot-Pluggable Redundant 1600-Watt Platinum Efficiency 120-240 Volt P.F.C. Power Supply.